clever picture viewer with customizable transitions. It was installed in a second. It's great to have the screensaver of my favorite movie! Thank you! Hmm, WC doesn't like underscores. 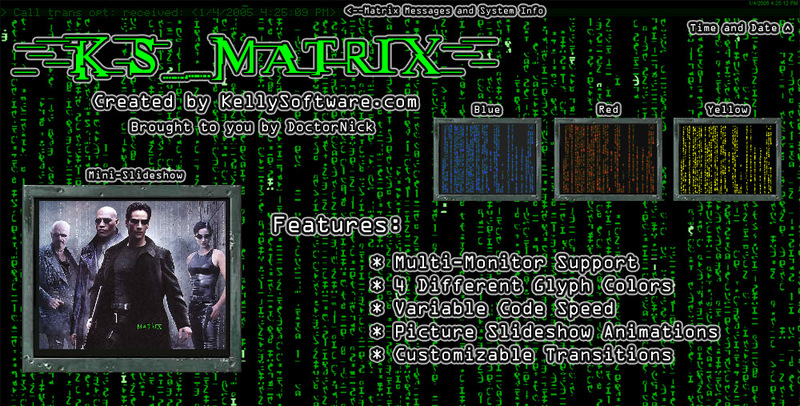 Anywho, the above link will take you to KellySoftware's screen saver page, and you can get to it from there. Other than that, wonderful! Thanks for the heads up Dr Nick! no problems here....try changing skins. This is incredible DN. I had not read the whole description before I installed so I was amazed by the system information display. This thing is fantastic, great and nice!!!! Not sure what husher got a hold of there but never opened anything on me. Nice screen. husher That language was totally unacceptable...here or out in the gutter where you 'might' think it belongs. Don't repeat it. Emm? I think I missed something. Not sure why, but get read error with repeats. No kudos for this screensaver. I like it but it's corrupt.